This weekend the Guildhall’s historic walls will be reverberating to the sound of some of the best music to emanate from Derry in recent years, as the very first Guildhall Beats Festival gets underway. The three day event will feature a wide variety of music genres and will be headed up by local stars Ryan Vail, Elma Orkestra (Eoin O’Callaghan) and young up and coming music sensation ROE, fresh from her recent UK tour supporting Northern Ireland favourites Snow Patrol. The festival aims to provide a platform for singers and performers from a variety of backgrounds to both showcase their work and share their experiences with emerging new talents. As well as some sensational live performances throughout the weekend, the programme also includes a series of interactive workshops, organ recitals and music therapy sessions exploring music culture from around the world, and the power of music on the mind. One artist who is particularly looking forward to performing to a home crowd is singer songwriter ROE, who has been pretty busy in recent months. Not many performers can say they’ve held their own in front of audiences numbering in their thousands, but this young star has been doing just that - sharing a stage with Snow Patrol on their recent arena tour. 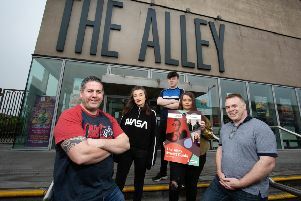 ROE – aka 19-year-old Roisin Donald – is now looking forward to a warm welcome in her home town and playing a more intimate venue in front of friends and family. You can catch ROE at the Guildhall this Saturday when she shares a bill on stage in the Main Hall with local artists Aul Boy, Conor Mason, Ryan Vail and Elma Elektra. Tickets are £15 plus booking fee from www.derrystrabane.com/guildhalla and from Cool Discs, Foyle Street.